I’ve had a request to share some sensory play activities for each of the sensory needs. 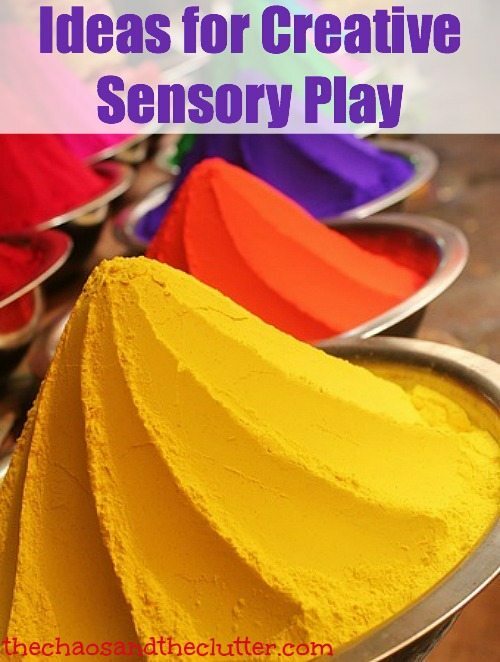 Tactile sensory play ideas are abundant (though I will provide some of those as well), but it can be more difficult to come up with ideas for the other types of sensory input. Sensory Processing Disorder (SPD) is a complicated thing. Those with SPD can have sensory differences in one or all of the areas. They can be either sensory seeking or sensory avoidant. To complicate things further, they can be avoidant in one area and seeking in another. The general areas of sensory input that are talked about in relation to SPD are tactile, vestibular, proprioception, auditory, visual, and olfactory. Many of the activities listed above can of course fit into several different categories. It is wonderful to give your kids the chance to try activities for all sensory inputs. This will benefit both sensory seekers and sensory avoiders. If you are looking for more sensory activities or for play suggestions, join now to receive the free 5 part email series Sensory Solutions and Activities and get your Sensory System Behaviours Easy Reference Cards.